With our political choices today, we wish we could pretend that what’s going on is some twisted, comedic version of House of Cards. Unfortunately for all of us, it’s completely real. There’s no use in dwelling on it, so let’s just pretend it doesn’t exist by diving back into House of Cards while we (patiently) await the fifth season. I’m not a big HOC buff, but I saw the majority of episodes each time my dad monopolized the couch after every season’s release. The series magnifies brutality and corruption, somehow getting its audience to root for unlikeable characters. Truly, there is no one on the show that you can look at as the underdog, or the person who deserves their prize. When you think about it, the show is a complete extension of Shakespeare’s Macbeth, if his characters hadn’t died at the end. I’m certainly not the first person to make this comparison—not by a long stretch—but I did come up with this realization without external influences. That means that the comparisons are so strong that multiple people individually have stood up and said “Frank Underwood is the modern-day American Macbeth.” And there is plenty of evidence to back this up; I’ll show you what I mean. Francis (Frank) Underwood, a power-hungry congressman looking to steal the presidency, is an obvious Macbeth character. Not only is he like Macbeth in motive, but also in practice. As stated above, there are no likable characters in this show, yet the audience often finds itself rooting for Frank in his underhanded scheming. Why is this? Well, much like in Macbeth, it’s because Underwood speaks directly to the audience through asides. From the get-go, Underwood lets us know that he doesn’t trust anyone (an obvious shared trait between him and Macbeth). By taking asides in which he explains his thoughts to the audience, we feel like we are a part of his schemes—that we are the only ones this powerful and charismatic man trusts, and that makes us feel special. It also keeps us interested. We follow Underwood in everything he does. We’re at every death, every plot point. However, comparing Underwood to Macbeth is so simple, it would hardly be worth a blog if the main character was the only tie between the two works. Bring in Claire Underwood—a perfect mirror to Lady Macbeth. She, too, has a taste for blood and wants to stand above the rest. In Shakespeare’s work, Lady Macbeth confronts her husband in a speech before killing King Duncan. She insults his manhood and makes him know that she is not proud of him. Though Frank Underwood never pulls any punches in the long-run and is never afraid or ashamed of doing whatever it takes to win, Lady Macbeth’s speech does mirror one of Claire Underwood’s in the first episode of the first season. Hours after Underwood finds out that he has been passed over for the position of Secretary of State, he comes home to his wife, who is visibly upset that he did not call. Calmly, Frank talks to her about the events of the day. She replies with frigidness and disappointment—not that he did not win, but that he doesn’t seem to be doing anything about it. Her desire for him to control his own fate is apparent. She walks away, implying that he is not being the man she married. Later on, after a sleepless night Frank confides in Claire, telling her that he has the motivation, but it’s going to take a lot of work from both of them. This is the first time we truly see the couple as a united front. They both know the objective and they will work tirelessly together to politically advance Frank’s career, which will in turn advance Claire’s standing as well. The slight Underwood feels when he is passed over as Secretary of State, a position that has been promised to him, is akin to the moment Macbeth hears that Duncan has chosen his son to be the next king. To be soothed, Underwood is offered good seats at the Jefferson Ball, and extra work that is supposed to come off as an “atta-boy!” Duncan, never having promised Macbeth any position, has no need to make anything up to him. However, that doesn’t stop either party from craving power. Each character ultimately decides he must obtain ultimate power. In Macbeth, King Duncan is the first target. Playing the role of King Duncan is President Walker—a high-powered man who trusts Underwood with his life. In Macbeth’s case, he was killing Duncan to fulfill the Weird Sisters’ prophesy. Underwood is fulfilling his own prophesy of vengeance. Walker does not actually die, but Underwood forces him into a compromising situation, leaving Walker to resign his presidency. As Lady Macbeth and her husband staged Duncan’s death to look like it was the fault of the king’s servants, Frank and Claire also put someone else on the chopping block. Raymond Tusk is a powerful businessman and close, personal friend of the president. In fact, he is such a confidant to him that he was asked to evaluate Underwood for both the position of Secretary of State and later on, the vice presidency. Seeing Tusk as a threat, Underwood seeks to put a strain on Tusk’s friendship with the president by tampering with some business deals in China. Meanwhile, Claire learns that the president and his wife are having marital troubles. She urges the First Lady to seek counseling, which she and the president do. Frank manipulates the bad business deal in his favor and comes out clean as a whistle. But this is not before an investigation of the president leaves him unwilling to reveal his personal life’s issues with the world. For this reason, both Underwood and Walker offer Tusk a presidential pardon in return for his coming clean to the judge and implicating the other. Ultimately, Tusk sides with the president, but Frank counteracts this by reigniting his own friendship with Walker. The president falls for this false alliance and calls off the pardon with Tusk. In return, Tusk says on the stand that the president knew about the deal with China. Walker resigns shortly thereafter. Death by a dagger–through his career rather than his heart. And then there are the Weird Sisters. They come to House of Cards in the beautiful form of, at first, one woman: Zoe Barnes. She may not have a bubbling cauldron, and she may be manipulated by Frank. However, her position as a spunky reporter with an investigative attitude makes her the eyes and ears of Washington. From her position, she can easily update Frank on where he stands in the political sphere. Later on, after Underwood has his way with her, she and two other reporters turn on him. What ties this group to the Weird Sisters is not only that their group of three is the same size, but rather that they are a powerful entity who are on the outside of the situation. Without Zoe’s affair with Underwood, none of the reporters have a stake in his world. They would be observers with predictions, just like the Sisters. Unfortunately, they, unlike the Sisters, lose power and are picked off one-by-one. Moving on to Macbeth’s next victim: Banquo. Poor Banquo was told that his descendants would be king. Macbeth saw him as a friend until he saw him as a threat. Underwood takes it upon himself to take Congressman Peter Russo under his wing. Russo is an alcoholic and divorced man from Pennsylvania who is just trying to make it in the political world—while enjoying a drink and a lady or two. 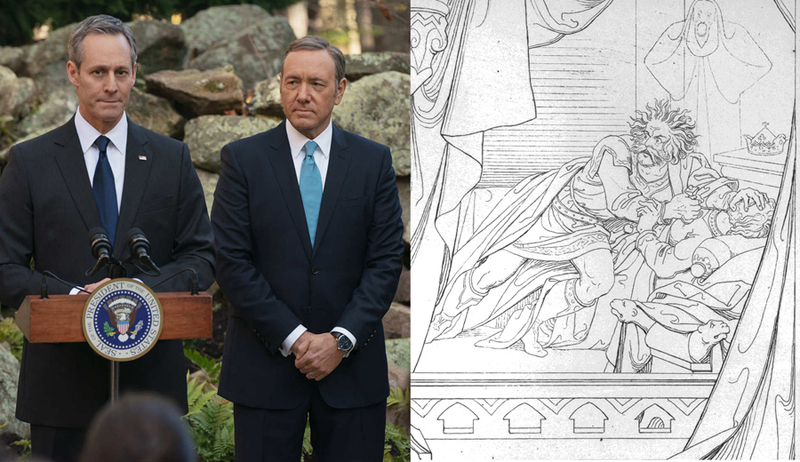 With the help of Underwood, he rises in the public eye. He gets cleaned up and plays the part of Underwood’s puppet, until Underwood sees him as a threat, that is. After Underwood no longer needs Russo, to whom he convinces that he is a friend, he conceives a plan to trap Russo back into a downward spiral to drugs, alcohol, and prostitutes. After sabotaging his career, he can’t let Russo go to the public with what he knows. So, Underwood traps Russo in his garage with his car running, never to wake up from his drunken stupor. Later on, much like Macbeth at the feast, Underwood sees Russo. He comes to him in a dream, along with Underwood’s former lover, Zoe, and they seek their revenge on his psyche. If you haven’t seen the show, you might think that Underwood is doing this without help. That is far from true. Whereas Macbeth hires assassins to do his dirty work, Underwood, too, hires some outside help. Doug Stamper and Remy Danton could fit the bill as assassins. Danton plays the less loyal of the two, ultimately quitting Frank all together after he grows a conscience and finds a way out. Stamper is far more allegiant. Although he takes a break from Frank to work for the woman running against him, Stamper ultimately returns with more information to share. Present at most every dirty juncture in Frank’s career, he shows himself to be truly handy as he aids in killing many people through literal and figurative deaths. A final interesting tidbit has to do with the name of the show, rather than the characters or plot. The phrase “House of Cards” refers to something that is so intricate it could collapse at any second–quite an appropriate name for the show that’s all about schemes and back-door deals. But, take the show’s name on a more literal level as well. House of Cards. What’s in a deck of cards but a King (Macbeth/Frank), a Queen (Lady Macbeth/Claire), a Joker (Banquo/Russo), Aces (high or low, the Weird Sisters/reporters—they can make or break the game), and all the numbers (the pawns that alone mean nothing, but when played strategically, can win). We all know that Macbeth did not win in the end. It remains to be seen whether or not Frank will. All will be revealed in time, but for now the writers are holding their hands close and don’t seem inclined to fold any time soon. For those interested, I have also been told to look into HOC’s similarities to Henry III, Othello, and Julius Caesar. Anyone who would like to peruse our Shakespeare holdings (including multiple illustrations like those used in this blog) in this year of his quadricentennial are welcome to give us a call at 513.556.1959, email us at archives@ucmail.uc.edu, have a look at us on the web at http://www.libraries.uc.edu/arb.html, check us out on Facebook at https://www.facebook.com/ArchivesRareBooksLibraryUniversityOfCincinnati/ or follow us on Twitter, @ARBLibrary. We’re located on the 8th floor of Blegen Library, and our hours are 8-5, Monday through Friday.